Things had been going pretty well for much of Gearbox’s showcase. There was a strangely hyperactive energy to everything, and Borderlands 3’s creative director had remained inexplicably silent during his first stint on stage, but the publisher rattled through many of its smaller announcements without a hiccup. But when Pitchford announced the Borderlands card game, Tiny Tina’s Robot Tea Party, you got the sense that things were about to start unravelling. It was at this point, when he began reading the rules of the game straight from a freshly-unwrapped box – as if he wasn’t sure exactly what he was showing off – that you felt that maybe he didn’t quite have full control of the situation. Then came the magic trick. Two volunteers were called to the stage, and each one was presented with a copy of the game. One of them was immediately relegated to the far side of the stage for several minutes while Pitchford chatted with her counterpart. As the trick progressed, Pitchford counted out nearly 100 separate cards, deliberately flubbing the first attempt at the trick to revel in the hype. It came off in the end, admittedly, but only after several minutes of showmanship from Pitchford, and a disastrous reveal from one of his volunteers. For a brief moment, after pleading with his tech support, everything seemed to get back on track. Pitchford the showman could return, resplendent in a black shirt emblazoned with a giant number three. But even once the Borderlands 3 trailer had finally been shown off, his ordeal wasn’t over – frame-rate issues meant the trailer had to be started again in order to show off five years of work at more than half a dozen frames per second. There came a point where you really had to feel for the guy on stage. But although it seemed as though everything that could have gone wrong had done so, there was something about the whole disastrous spectacle of it all that captured the spirit of Borderlands. My fondest memories of the previous games involve sprinting full-pelt from one carefully-sculpted disaster to another, barely stopping to register the narrative unfurling around me, reveling in the mad guns and the massive explosions and the sheer, frantic energy that’s defined the series since its very first outing. 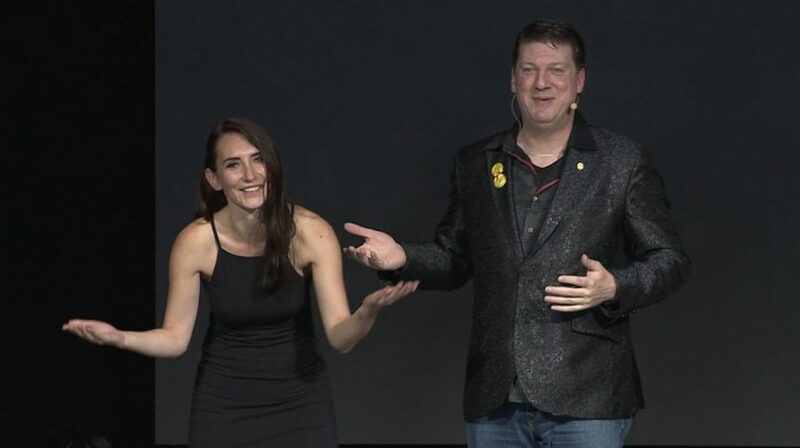 Randy Pitchford might wake up with a few more grey hairs tomorrow morning, but I can’t think of a more fitting way to have brought Borderlands 3 kicking and screaming into the public eye.